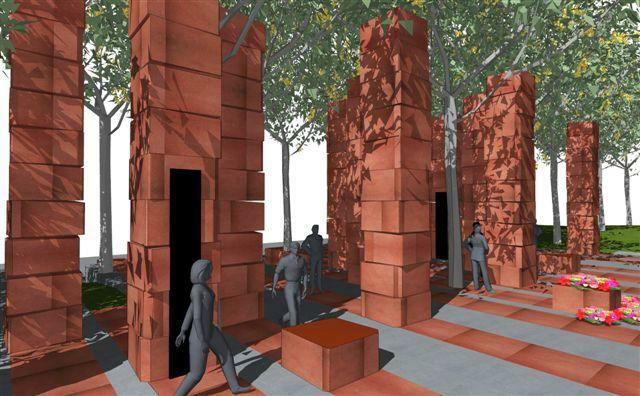 There is one year to go before ANZAC Day 2015, and therefore only one year for the War Memorial Park to be up and running. That means, of course, that the War Memorial Underpass needs to be in place well before then, which is a pretty steep ask, but at this stage it looks as though it will be finished in plenty of time. The almost exclusively Maori / Polynesian workforce of reinforcing guys have been doing the heavy lifting – the grunt work of building the large steel reinforcement cages that give the concrete box its strength. NZTA’s construction crew have been working at a steady pace, concreting side walls, the first few bays of concrete rooftop are in place – they are about a third of the way through laying the concrete deck over the top, and the move of the Creche of Compassion seems to be imminent. 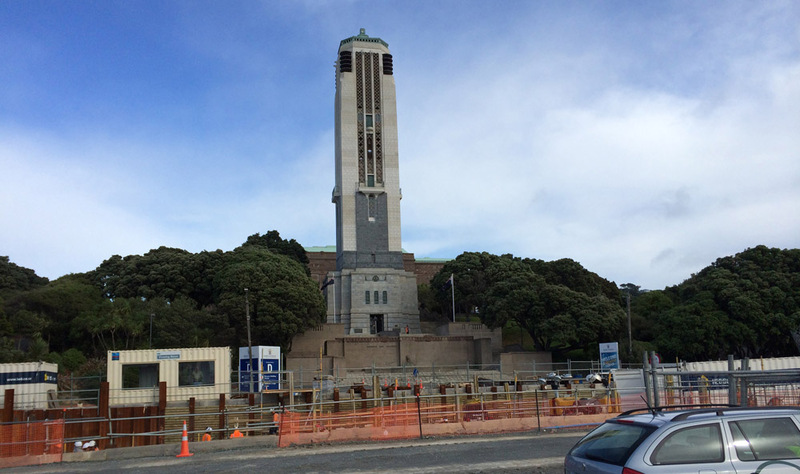 It’s not just the Creche on the to-do list either – they’ve also got to build the contraflow parking for the local Mount Cook School, and then of course start prepping for the War Memorial flyover as well. With a bit of luck, the Basin Bridge Board of Inquiry may just about be complete by then… Incidentally, is that temporary road going to end up being New Zealand’s most expensive road (per m2), given that it was only there for just two years? Normally a road will “pay itself off” over a number of decades, but given that a full highway spec road was constructed for this tiny length of time…. No, it just isn’t worth even thinking about. Literally, money down the drain. All in a good cause, of course. All in the best possible taste. 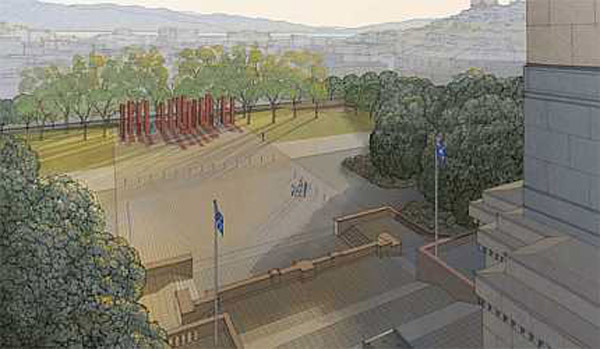 And then open in 12 months time with a massive 100 year commemoration of our national war dead. There, nothing to it! Just remember, it CANNOT be late. No pressure…. 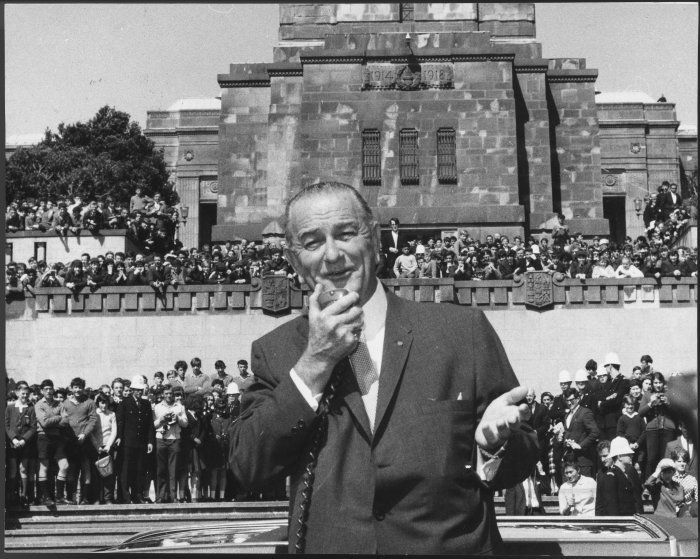 No pressure at all… But just as a reminder, here is a pic from 1966, with Lyndon B Johnson speaking outside the War Memorial – it is likely to be a big occasion this time as well. Presidents? Royals? Australian Governor-Generals? Even (uggh) Tony Abbot, the mad monk? As far as loathsome bits of scum, he’s pretty bad, but I suppose they will have to invite him, seeing as he is in charge of the West Island… Security will need to be tight next year! We can already see the design of WAAL coming through, in the concrete pour for the edge of the western portal. Unlike the Mt Victoria tunnel portal (featured so prominently in this recent post), there is no symmetry involved in this design. It is always the most nerve wracking time of a project to me – the heart in mouth feeling as the shuttering comes off, and the concrete is exposed. Did I get the drawings right? Have the contractors built it according to plan? Will the rest of the bits coming in a year’s time fit correctly onto the bits we’ve built today? It is very strange seeing the bare hillside that they built the thing on. There certainly isn’t room for thousands of hat-wearing people to gather there today. Presumably it was bush at one point and the early settlers cleared it. So did they clear it and leave it undeveloped, or was there some development on the hill that was demolished and removed to make way for the Memorial? I think the new park should be a real asset for the city. We have waterfront parks and hillside wilderness, but don’t really have an inner-city park at the moment. I also like the idea that Tory and Tasman Streets will not intersect with the bypass, and become a bit more inner-city urban rather than being a route to the bypass. The hill, Mount Cook, was probably covered in bush in pre-European times, but even the very earliest pictures of Wellington show it bare I think – all those early white boys were quite keen on chopping things down, and chopping them up, and shipping the logs off back home to Mother England. 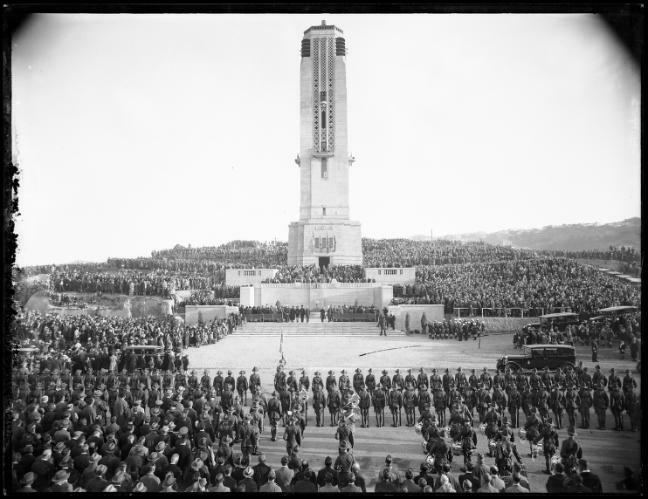 The site itself, Mt Cook, then became the site for the massive ugly jail, which was so big and so ugly that by the time it was completed, it was time for a change – it rapidly became the Mt Cook army barracks, for the 65th regiment amongst others. Eventually, it was demolished – just pre-WW1? 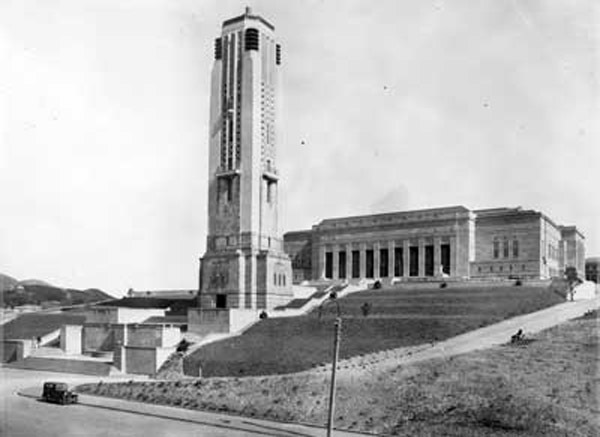 and replaced with the Dominion Museum by the end of the 20s. I suspect that the whole area was covered in army/school/church-connected architecture between the Boer War and WW1. Interesting that you ask who, or why, those slopes were planted with pohutukawa. Perhaps instead you should be asking – to whom does the land belong to, that the trees stand on? The land in front of the Museum belongs to the local / Taranaki tribe, Te Atiawa, who lived on this hillside before the pakeha came. The trees are indeed a sign of that world, and very special to the land there.